Earlier in the year an opportunity on the Crafts Council website caught my eye, an open call from the National Trust for a maker to develop a range of their work exclusively to be sold at seven NT properties, and on their website. 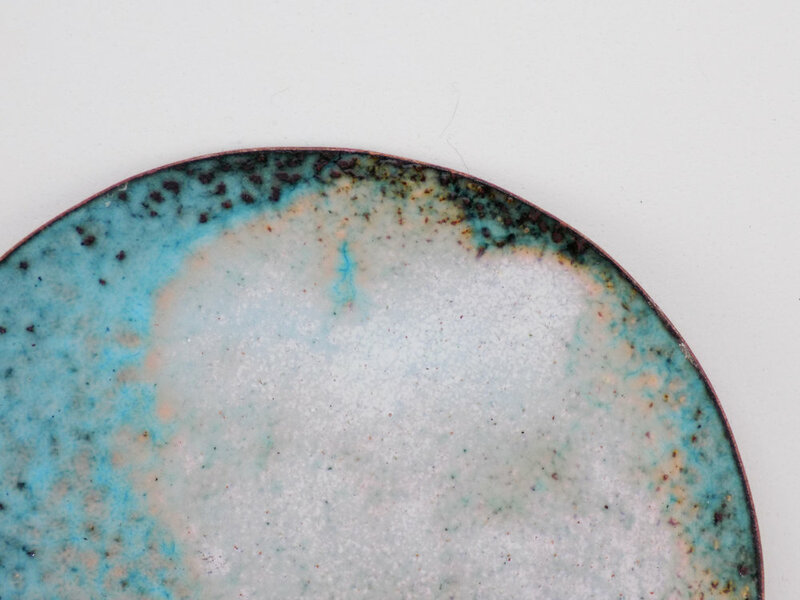 I knew immediately that I wanted to enter my copper enamel bowls, as they were inspired by patinas and textures I have seen on stonework and garden ornaments at National Trust properties, along with the opulent reds and golds found in many stately home rooms. These bowls are my contemporary take on aging, I create colours with golden edges and the nature of the process oxidises the copper of the bowls, which can either be polished to brighten up, or left to age natural, their appearance changing over time like those in the National Trust gardens. 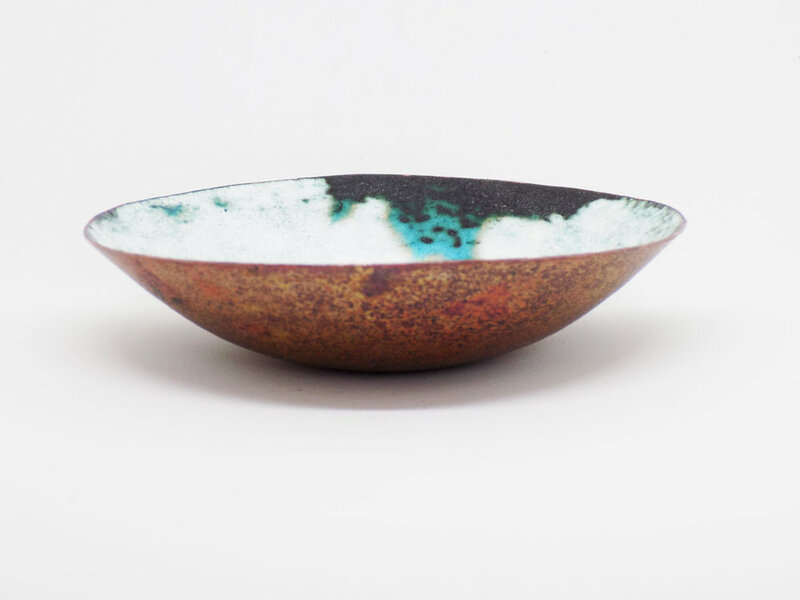 I burnish the edges of the bowls to give them a high shine, in contrast to the oxidised surface. My camera isn't quite good enough to pick up these details! I knew I needed to take along examples of my work and packaging, but as the call was to develop a new exclusive range I made some moodboards, using Basildon Park as inspiration, to show how I would make a range relevant to the NT properties. I also made some new bowls to show exactly what I had in mind, having found a room in Basildon with a beautiful sky painted on the ceiling which I wanted to recreate. I was also keen to create some bowls using the garden as inspiration, mainly the statues. The finals were held last Wednesday, and five makers were invited. We were seen separately so I didn't get a chance to see who the others were, or their work. I set my work out and the 'interview' (it was far less scary than that word makes it sound) took place for about an hour, with questions being asked by two National Trust buyers and a Crafts Council representative about my practice, processes and ideas. I never tire of talking about making, although as I had been up since six that morning to get to Basildon Park in time (the downside of living in Norfolk, and trains!) I wasn't quite on my best form, and embarrassingly couldn't even remember the names of my local National Trust properties, which I've been too many many times! However I think I represented myself and my ideas well, getting my passion across and I even managed to forget I was being filmed. Sort of. Edit - Unfortunately my bowls were not selected at the winners, but it was a great experience nonetheless. You can find a selection of bowls here to buy or visit one of my stockists, currently Zelleys, The Giggly Goat and The Sainsbury Centre of Visual Arts, all in Norwich.